Preheat oven to 350 degrees F. Coat 12 Texas-sized muffin cups with cooking spray. In a medium mixing bowl, sift together flour, baking powder, baking soda, salt and cinnamon; whisk in oats and butterscotch chips until combined. In a large bowl, using a mixer on medium speed, beat together butter and brown sugar until creamy, about 1 minute; beat in applesauce, eggs and vanilla until combined, about 1 minute. Reduce mixer speed to low and gradually beat in flour mixture, alternating with milk, until combined - about 1-2 minutes. Stir in apple and pecans until combined. Divide batter into muffin cups. I pressed dried apples into the surface, but that's optional, of course - and then I drizzled them with maple syrup and sprinkled the muffin tops with cinnamon-sugar. Bake for 30-35 minutes or until golden brown, and a toothpick inserted comes out with moist crumbs attached. Cool for 10 minutes on a wire rack, before running a knife around outside edges and removing muffins onto wire racks to cool. 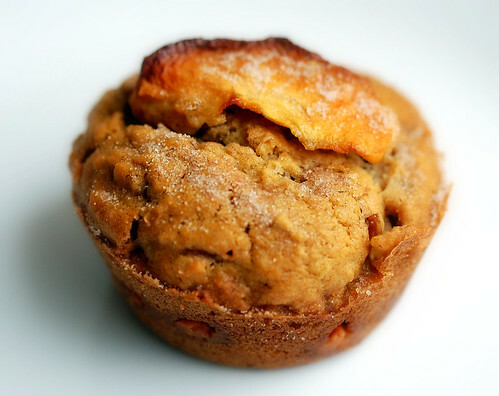 34 comments on "Cinnamon-Apple-Butterscotch Muffins"
so cool that you were on ultimate recipe showdown! you've had a pretty remarkable year, hope 2010 will be a great one! 2010 is full of possibilities. Have a safe and foodie-filled New Year Emily. All the best. Emily, It looks like you have had a blast this year and you deserve it. 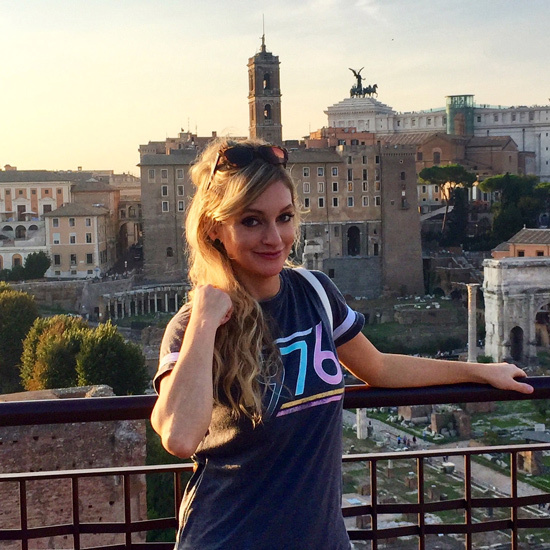 Your blog is one of my favorites and I'm looking forward to all your new recipes in the coming year! Have a wonderful New Year! These look like they'd be delish for breakfast or a snack--or heck, anytime!! :-) Apple and butterscotch is always a good pair. Happy New Year!! These look marvelous and I love the flavor combination. I'll have to try them. I made your cashew toffee stuff last night for my New Year's party and tried it this morning. It almost became my breakfast, but I knew if I ate it that I'd be hungry by ten and I wouldn't be able to work because all I'd be thinking about is the toffee sitting at home. Happy New Year! Wow, that is quite a year you've had! When do you go back to NYC? That cracked me up when you said,"Will Rosie O...." You're too funny! As usual, another recipe that sounds delicious! You really did have a big year didn't you?! Happy New Year's! Great muffins. I think it's a great combination of flavors. In 2000 I got engaged, turned 30, and spent a lot of times doing stuff like wedding planning and house-buying and generally was pretty boring for anyone who wasn't me. My decade definitely had more interesting years. You are so talented and adorable that I know your year ahead will be even more wonderful than 2009. Happy New Year. You've had a busy year, Emily, and it's been fun to experience it along with you. Visiting your blog is always a very sweet treat. I hope the coming year brings all of us good health, happiness and peace. Best wishes to you. This recipe sounds like a real winner. I'll be baking them for the New Year. Thanks for a great year of recipes and stories. Keep up the good work! Your blog is the best. Looks like you had a busy 2009! Your muffins looks really good. 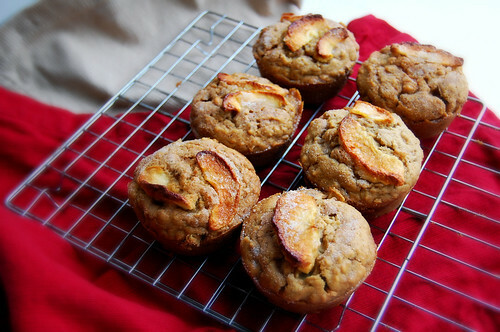 Awesome muffins - love the big slices of apples on top! Happy New Year!! The fact that you were in 8th grade in 2000 makes me think I should not be blog friends with you. I had just graduated from law school and moved to Chicago with my then-boyfriend/now-husband. yep, you've had quite a year! congratulations on all you've achieved, and here's hoping 2010 is even better! Bookmarked these! What a fun year for you. I hope 2010 is a great one too! Emily - Truly what a year you had. Very exciting, heart breaking I'm sure and thrilling all wrapped up in a twelve month package. You are an amazing person and I know great things lie ahead for you in the new year to come. So - ring it in big tonight and I'm wishing you much joy in 2010.
p.s. I wish I had met Al!!! In 2000 I think I listened to Sugar Ray too. And I wore Doc Martins. Boy, what a difference 10 years will make. And Sugar Ray? Never again. Good luck in 2010! What a great year for you Emily! I hope 2010 is EVEN better. 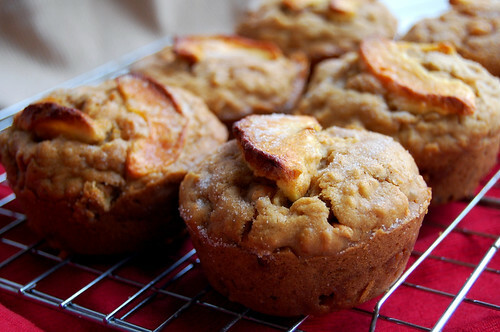 These muffins are right up my alley...apple and butterscotch = yum! Happy New Year. These sound great! 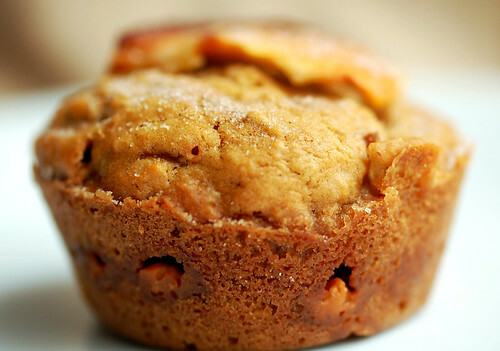 I am not usually a fan of apple muffins - but with the butterscotch - I am there! Hope you have a fantastic New Year Emily, full of even more opportunities than this year! cinna+apple+buttascotch= THREE OF MY FAV THINGS! What a year of accomplishments for you! Here is to a great new year 2010 together! What a year Emily! I wish I could have see your Top Chef-Quaker Oats Quickfire Challenge. I think 2010 is going to be a year of opportunities for you, and I can't wait to follow you on all your adventures! Wishing you and yours a happy and healthy new year! Making home made applesauce so that I can make your latest tantalizing recipe...perfect for the first day of school after a wonderful winter break. Thank you for such a yummy recipe. The perfect muffins to start the year! What an amazing year girl! wow! You should be so proud of all your amazing accomplishments. Plus you never cease to amaze me with your beautiful food. These muffins sound heavenly!! Take care! Haha, Erin. I'm glad you liked it!